Medical students do not need to carry heavy books all the time for study. Theseandroid apps for medical studentshelps in studies. Students can study various general topics from these apps. In this article we are going to explain about the best Android apps for medical students with a brief description of each. 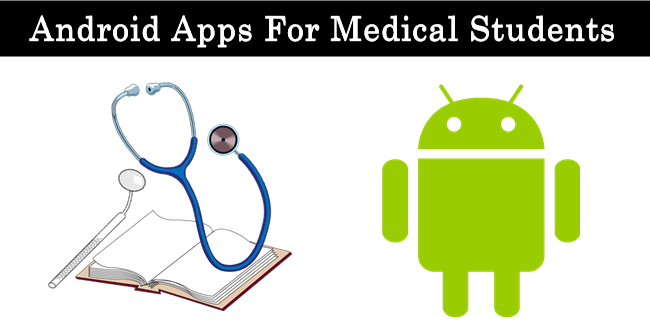 List of Best Android Apps For Medical Students. This app is awesome for Medical students or other students. It has a rating of 4.4 on Google play store. This app is mostly used by the nurses, physicians and chemists for healthcare information. We can easily study on our Android phone through this app. We an also read the latest medical news from this app. It is a light weight Android app. We can know about drug information, Medicine from this app. It also covered the 1000 medical topics. It support Android 2.3 or higher version. We can access 129 medical calculators which is covering the formulas, scales, through this app. Diseases dictionary app is most important in all android apps for Medical students. Students can easily search any medical words and symptoms of diseases with complete definition. It do not require internet connection and works completely offline. It is a light weight android app. This app is used by the Hospital nurses, Health Professional, Medical students and Physicians. This app tell us about different diseases with definition and meanings. It require Android 2.3 or higher version. This app provide high resolution images of different parts of body with description. It supports languages such as English, French, Spanish, and German. It is also provide audio pronunciation. We can easily understand anatomy and physiology with help of this app. It provide a good search option, we can easily search the different body organs and parts. It has many contents like Muscular System, Circulation System, Urinary System, skeletal System, Female and Male Reproductive System with descriptions. Anatomy guide app is simple and easy way of learn of different anatomical structure. This app is amazing in all android apps for Medical students. This app is provide us diagrams, photographs, lectures and tutorials. It is divided into subcategories such as Anatomy guide, Cardio vasculaire system Digestive system, Endocrine Alimentary system etc. We can share information with our friends through this app. 3D Brain app is awesome in list of android apps for Medical students. If you want to know about the different parts of brain then this app is really helpful for you. It covers entire topics associated with internal and sensitive parts of brain and it improve our knowledge. It gives us 3D images, labels and with information. It has many categories related with brain like Pons, Perirhinal Cortex, Somatosensory Cortex , etc. It is another good medical app for Android users. This app tell us about diseases within one minute. We can sharp our medical skills and treatment medical cases with this app. It is providing different scenarios within few minute. One new scenario is added every week. It has a rating of 4.6 on Google Play store. It is also helpful for Medical students and other Health professionals. It is another amazing in all android apps for medical students. It is a good source of knowledge for medical students involve in clinical practice. It is also too light weight android app. We can share link our app on facebook, whats App etc. This app has divided into further category such as General concepts, Autacoids, CVS, Renal much more. It provide more than 17 topics related with medical students. Every chapter include mnemonics to remember different topics. This app is covering important topics with the help of animation. It is very useful for medical students or nursing students and other medical related students. It is also provides tutorials and quiz’s. It has many features like multiple choice questions which help us for exams preparation, zoom in and zoom out. It provide information about internal body parts to show image with label. This apps is very helpful for physician and medical students. It has a rating of 4.6 on Google play store. We can easily learn clinical cases and these cases are based on the real life scenarios.